Complete Set of 4 Wine Bottle & Glass Rack Stacking Units 52"
This high quality, exquisitely finished, Complete Set of 4 Wine Bottle & Glass Rack Stacking Nesting Units measures overall 52" height x 19.75" width x 12" deep and is brand new. The manufacturer is Authentic Models. The Bottle & Glass Rack Stacking Units are handmade of solid wood. Handcrafted construction with solid brass hardware, all corners are banded with solid brass. The stacking units are finished in an antiqued lightly distressed honey French finish. On the bottom of the units is a rugged nesting wooden rectangular section that sets into the top of the other available wine & glass stacking units, this nesting section also makes for a sturdy base if the unit is placed on the bottom of the wine & glass rack assemblage. Included are three unique wine & glass rack stacking units (MF210, MF211, MF210 all included) and a single serve tray (FF107 included) that provide a compact assemblage. The units nest on both the top and bottom which makes for a sturdy construction. The single serve tray nests on the top of the assemblage and becomes an indispensible surface for pouring and for serving your fine wine & cocktails. MF212 Glass Unit #1, The glass rack has storage room under the glasses for coasters & shot glasses. MF211 Bottle Rack/Bookcase Unit #2, There is an X shaped crisscross wooden insert that can be removed to convert from a wine rack to a plain bookcase unit. 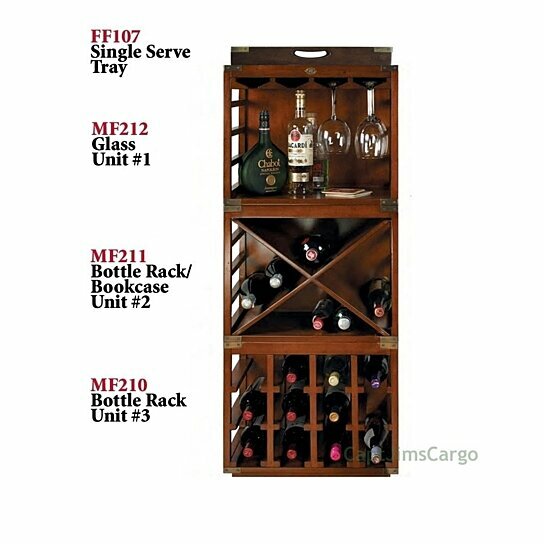 MF210 Bottle Rack Unit #3, The wine rack holds 12 bottles. FF107 Single Serve Tray, The Single Serve Tray has hand holds cut out on all four sides. On the bottom of the unit is a rugged nesting wooden rectangular section that sets into the top of the other available wine & glass stacking units. Each unit individually measures 16.5" height x 19.75" width x 12" deep and the FF107 Single Serve Tray measures 2.5" height x 18" width x 10" deep. This Complete Set of 4 Wine Bottle & Glass Rack Stacking Units makes a unique compact home bar and will certainly be a great addition to your nautical decor.